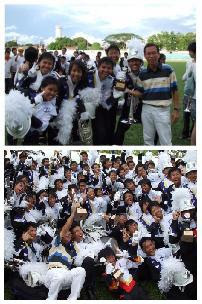 Jit Sin High School...Champion again~~!! The winning team...smiles of Victory!! It has been 3 years since I left secondary school...itz kinda unbelievable that time passes by so fast!! Seeing our juniors performing in the state competition yesterday really brings back lots of memories of those days when we were one of those kids marching on the field. Really can't imagine that I could stand the afternoon sun...marching with just a cap on my head and getting so tanned last time...bet i would never do anything like that anymore now!! This is the 4th consecutive year that our school band won the title and this year is even better, they 'swept' all the awards (best preparation, best drum major and champion)....Fabulous!! 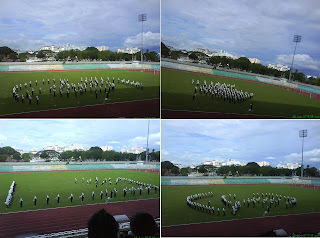 Hope that I can go to Bukit Jalil on July 8 to support them in the national competition!! Well done guys! !